Shortly before departing on a tour of the United States in the autumn of 1993, Sergio Assad was unexpectedly offered a commission to compose the music for a film, which for him was a dream come true. 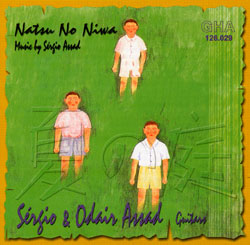 The Japanese film director Shinji Soumai, an enthusiast of guitar music and admirer of the Assad brothers, asked them to compose and record the music for his film Natsu No Niwa (Summer Garden). As time was limited, Sergio worked day and night on the composition of the Natsu No Niwa Suite, sending the scores to Odair as they were completed. Sergio and Odair left for the United States, studying the film score between concert engagements and recording the music in New York on the only two free days of their American tour. It was decided that a CD recording of the music should be released to coincide with the film premiere, to be recorded at a later date in Europe. A few days before the recording date, Odair had a fall while playing with his young son Gustavo, injuring the index finger and the middle finger of his right hand, causing much pain and swelling. Odair did not attach great importance to his accident and refused to postpone the recording date. Despite considerable discomfort he continued working for two days. When the recording was finished he consulted a specialist who advised him to rest his right hand for at least four weeks... two of his fingers were broken! Natsu No Niwa — A moving story of three boys and an old man The three boys were classmates in the 6th grade. In early summer after the death of one of the boys' grandmother, their interest in death grew to such an extent that they decided to observe a dying old man who lived alone in their neighborhood. They took their "detective work" very seriously, keeping watch on the old man's house and following him whenever he went out. At first they were driven by a sense of curiosity, until one day the old man caught them and spoke to hem very severely. The boy's attitude began to change and they began to enjoy the time they spent in the old man's company. The old man too began to change from a weak and lifeless being into a much stronger person. The relationship developed from a "young versus old" confrontation to a true friendship. The boys helped to repair the old man's house and listened to his stories about the Second World War, which was the cause of his present lonely existence. As they learned of the reason why the old man had had to leave his wife, the boys decided to find her and speak to her on his behalf. At last they found the old lady and were surprised to discover that she was the grandmother of their school teacher. The story ends with the sudden death of the old man. In the last scene the boys watch as his house is demolished.The summer spent in his company had left the three boys with very special and abiding memories.